Before getting started though, I would just like to say this again, this is only me playing devil’s advocate. If a Nexus Two phone is announced I would be one happy guy. One thing to note: the picture in the title is a mock-up done by Gizmodo. 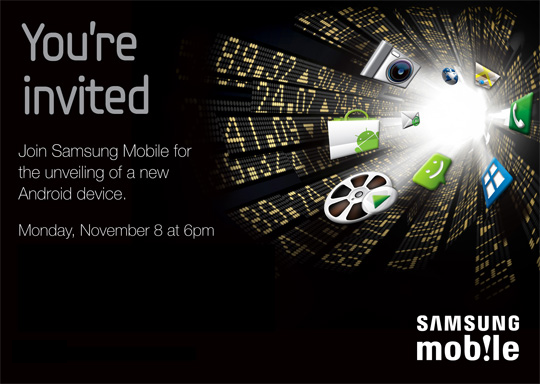 The rumor is that at the Samsung event on Nov. 8th, 2010 Samsung will be announcing more than one Android device. The reason for it being more than one is due to Gizmodo’s exclusive regarding the apparent Nexus Two one of their tipsters got to play with. Right now everything points to the Samsung Continuum being a definite part of the announcement but with the Nexus Two rumor, this second device has been tacked on to the slate. The official invitation to the press event causes one reason to believe the Nexus Two won’t be announced on Nov. 8th, 2010 just by what appears on the actually invitation. One commenter on the Android and Me article regarding this rumor points out that all the icons are TouchWhiz icons along with the stock ticker background which would lead one to believe it’s in association with the dual-screens the Continuum sports. The Nexus One was Google’s little flagship phone and having the press event invitation reflecting absolutely nothing in regards to stock Android makes little sense. Google saw some poor sales regarding the Nexus One and one would have to think more hype regarding its new brother, the Nexus Two, would help increase awareness and sales so close to announcement time. Gizmodo’s article was about as vague as it gets for a ‘hands-on’ exclusive. If this Nexus Two is ready for announcement as soon as Nov. 8, 2010 why didn’t the person who was having the hands-on check the Android version is was running? Taking 2 seconds to check that would have cured a lot of the speculation. Also mentioned in the Gizmodo exclusive was the fact that the hardware and performance seemed less mind-blowing then one would have thought the Nexus Two should have. At the time the Nexus One came out, it was one, if not the best Android phone out. To make its successor slightly average doesn’t make any sense either. The draw of the Nexus name was that at the time it was one of the best. While the Nexus Two may run better then the Nexus One, it seems almost pointless to not make it better than anything else currently available. This is strictly going by what was said regarding the Nexus Two’s performance as the specs aren’t known at all right now, only rumored. I would imagine for one of the current top Android phone manufacturers with some of the top Android phones that Samsung would do more justice to the Nexus Two then what is currently being put out there regarding the performance it has. On another point Google has never committed to actually making a Nexus Two, at least publicly. If Google were to have changed their minds behind closed doors, would they really want to announce a second flagship-type phone that has a “really buggy” version of Android on it? They have never done that so why would they start? Lastly, when regarding a rumor that has multiple trusted sources, one of those sources can usually leak a photo. While this isn’t always true (like the recent Motorola phone releases), it does happen more often then not. A phone sporting the Nexus name would have had some sort of photo leaked out, even from Mr. Blurry Cam, with it being so close to the announcement. In the end though while a Nexus Two phone being announced with Gingerbread would be great, there just doesn’t seem to be enough power behind the rumor when regarding the actual phone and its performance. As a Nexus One owner and an Android user since day 1 (still have my G1!) what is currently being said right now regarding the Nexus Two isn’t really that exciting. Could Samsung announce more than one Android phone on Nov. 8th, 2010 and could it be running Android 2.3 (Gingerbread)? Absolutely. Will it be the Nexus Two? That should be taken with a big grain of salt. Hopefully I’m wrong though and that it is the Nexus Two and that it has specs that blow anything else out of the water.